The amount you have available for a down payment will affect what types of loans for which you can qualify. Down payments typically range from 3.5% to 20% of the sales price. Most people save a couple of years for their down payment. 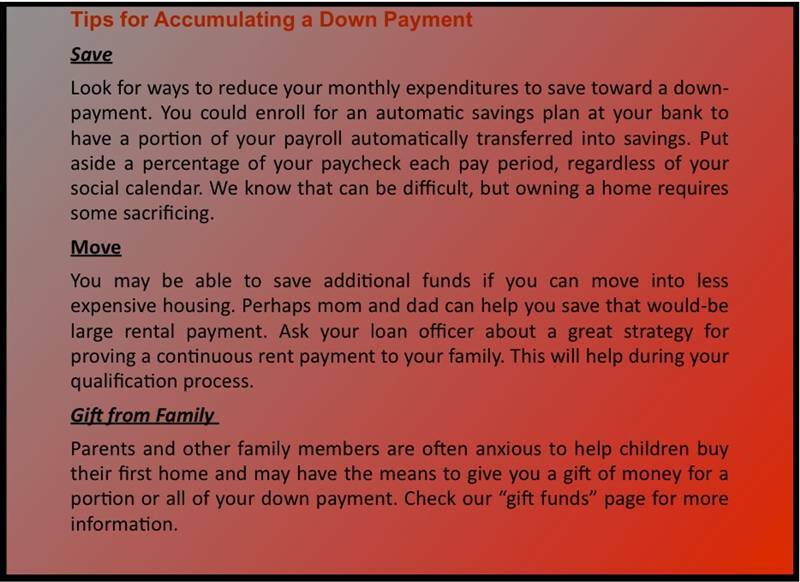 Perhaps you can get a few ideas as to how you can save for your downpayment below. Lenders seek your documenting the down payment coming from your savings. They want to see that you will have enough savings and/or assets over and above the down payment. This gives the lender confidence in your strength as a borrower and your ability to repay the loan. Take extra care to document the sources for any monies to be used for the down payment or closing costs. The primary mission of Housing Finance Agencies is to boost home ownership in targeted areas, among first-time buyers and those with little money for down payments. Most of these non-profit agencies were funded with state government seed money and now operate independently.Click here for a list of Housing Finance Agencies.